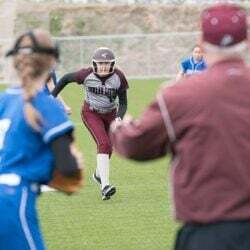 Lewiston’s Danielle Cyr connects on a pitch while her teammates in the dugout look on during a 6-1 win over Lawrence in Lewiston on Wednesday. 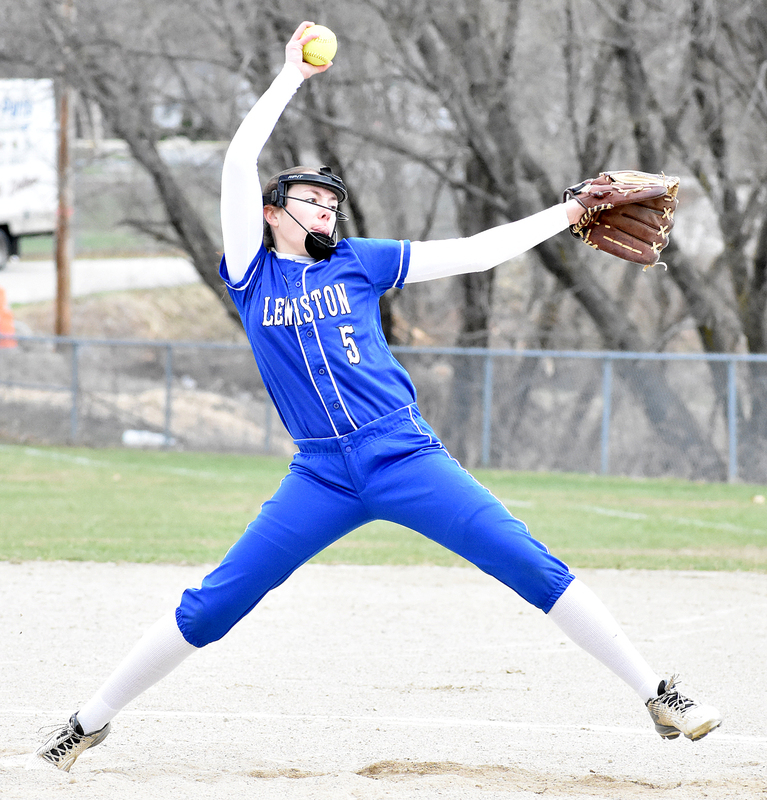 LEWISTON — A pitchers’ duel looked to be headed in the wrong direction for Lewiston in its season opener at home on Wednesday. 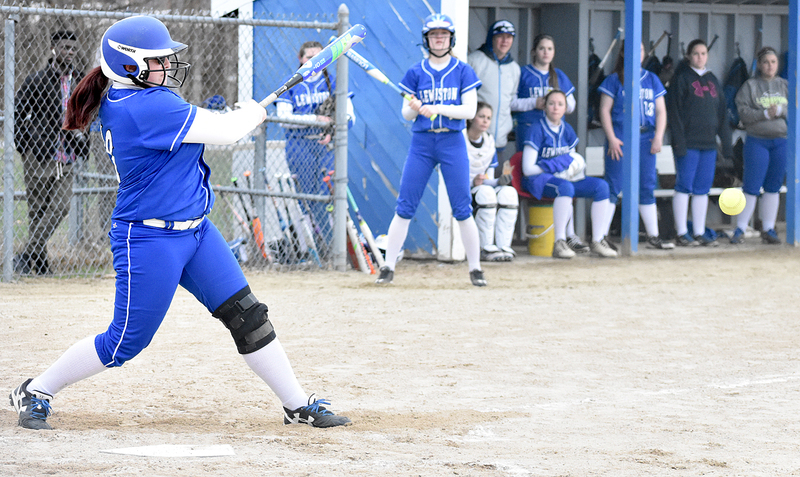 With momentum still within reach, Lexi Poulin put a line drive out of reach, giving the Blue Devils a lead they didn’t relinquish in a 6-1 victory over Lawrence. None of the first 11 Lewiston (1-0) hitters could muster a hit off Lawrence (0-1) pitcher Lilly Herrin. Meg Theriault, the Blue Devils’ pitcher who had struck out seven Bulldog batters through four innings, then broke up Herrin’s hitless start. Two batters later, Poulin laced a liner in the vicinity of Lawrence left fielder Lauren Lambert, who couldn’t get a glove on the hard-hit ball. 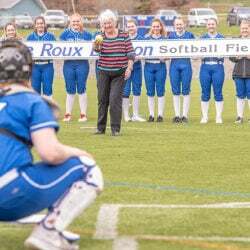 Theriault made it home from second, and Poulin soon joined her at the plate after racing around the bases with a two-out, two-run home run, which turned Lewiston’s 1-0 deficit into a 2-1 lead. The Blue Devils added another run in the frame when Danielle Cyr and Emily Mousseau followed with singles and Cyr later scored on a double steal. Theriault, who allowed Lawrence’s only run in the fourth on a pair of hits and an error, settled down in the fifth and sixth thanks to a lead in her favor. She scattered a two more hits across the two frames, while striking out three more batters to up her total to 10. Lewiston tacked on three more runs in the bottom of the sixth. Jordan Mynahan led off by reaching on an error, then consecutive singles by Poulin, Cyr and Mousseau added up to a run. Three batters later, Meagan Gosselin smacked a two-run double to right-center. The Bulldogs tried to mount a comeback with their last chance in the top of the seventh. Theriault picked up two quick outs with a strikeout and a groundout, but Sam Knox reached on an error to extend the game. 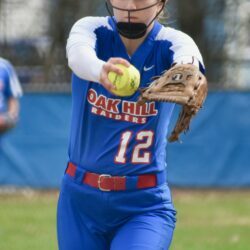 Herrin and Haley Holt followed with singles to load the bases, but Theriault struck out Gretta Knowlton to end the threat. 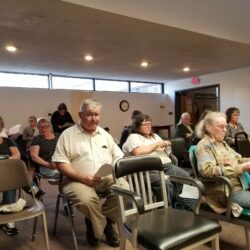 “Fairfield kids don’t give up,” Marcoux said. The final punchout gave Theriault 12 for the game, and she didn’t issue a walk. She was able to avoid big damage with the nine hits she allowed. “Meg T pitched a heck of a game,” Child said. 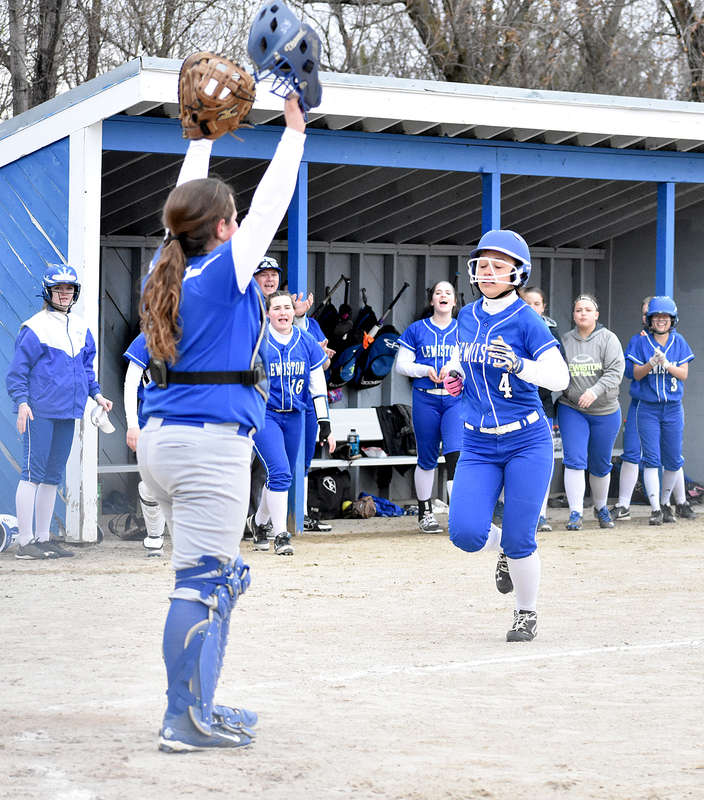 Lewiston’s Lexi Poulin (4) heads home after hitting a home run as her teammates cheer her on, while Lawrence catcher Haley Holt awaits a throw during Lewiston’s 6-1 win in Lewiston on Wednesday. Lewiston pitcher Megan Theriault tracks the ball to the plate during a 6-1 win over Lawrence in Lewiston on Wednesday. 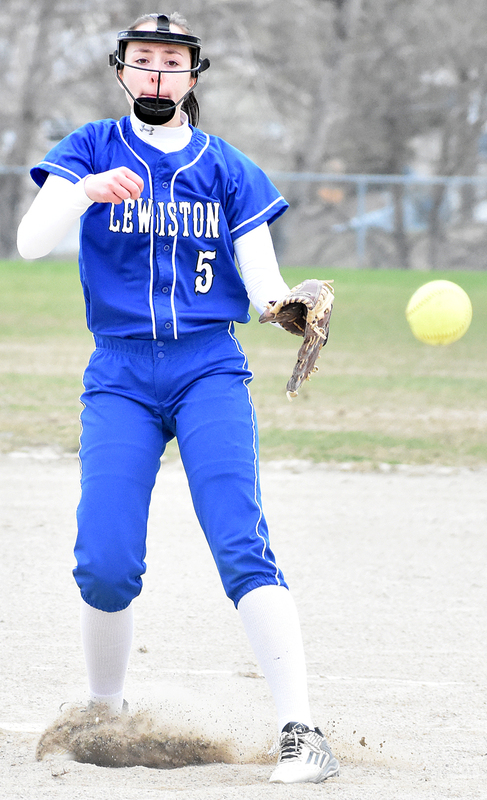 Lewiston pitcher Megan Theriault winds toward the plate during a 6-1 win over Lawrence in Lewiston on Wednesday. 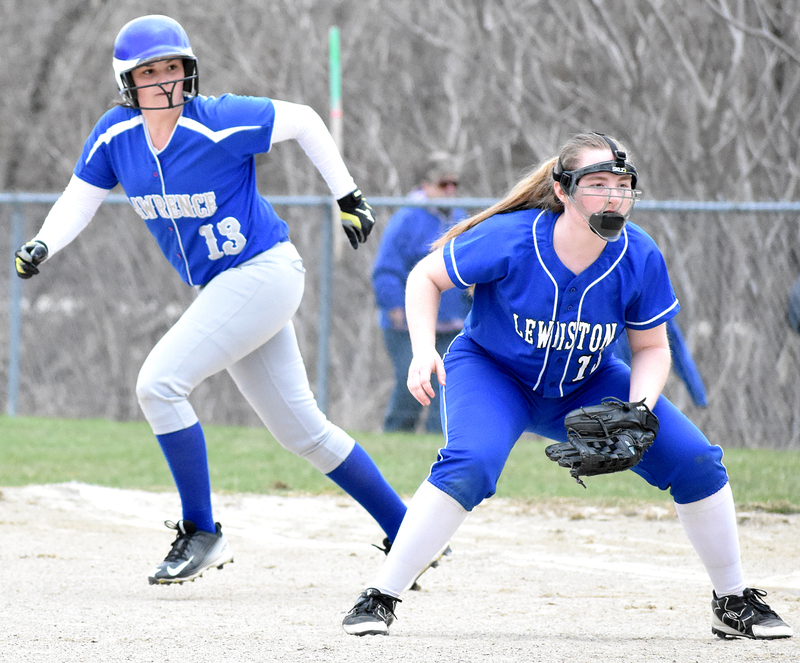 Lawrence’s Lilly Herrin steps off first as Lewiston first baseman Kacey Hopper anticipates a ball in play during Lewiston’s 6-1 win in Lewiston on Wednesday.